Quester enhances the questing experience by improving upon the built-in Quest UI, smoothing some rough edges and providing a few enhancements. Quester was inspired by SmoothQuest and the add-ons SmoothQuest was based on before it. It is designed entirely for the new questing experience in Warlords of Draenor, and will not function in Mists of Pandaria. Quest levels in the quest log, on the map, in the quest tracker, in NPC dialogs, everywhere! Move the Objective Tracker to wherever it fits into your UI! Quest progress color is not displayed. why isn't there a way to change the color of the quest tracker? Did you fix it somehow or just disabled quester/aurora ? Hi! I was looking for an addon that let me move the quest tracker and found yours. It's supposed to do that and other little things that sound convenient to have. Problem is that changes on the options are not getting saved. I can unlock the frame and move the tracker to another position and lock it again, but it gets reverted as soon as I /reload or log out. Disabling the coloring of quests isn't working either. 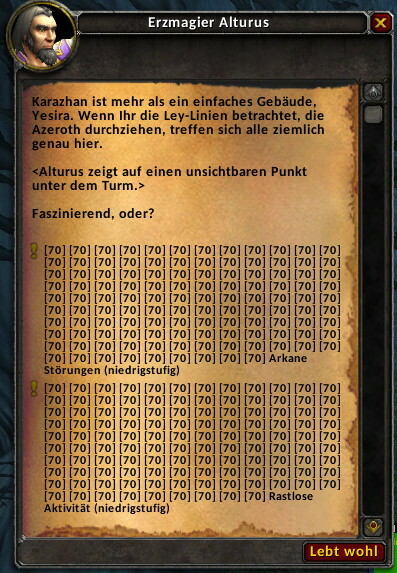 Also, all new quests (like those in the Vindicaar) and world quests appear as impossible (red color). EDIT: Colors are working, I didn't know they changed color depending on objective completion (an option to disable this behavior would be nice). Seems like only saving the position of the frame isn't working. Is there any way to turn off the coloring of objectives? Hello, love this addon. Would love it if Quester & Kaliel's Tracker would not taint each other anymore! Thanks in advance! when will this addon be updated again? is this going to be updated now or is it waiting for 7.2.5 Release? It is tainted by Mapster. i also just got the tainted by Adibags error. 1) Anyway to change font type? 2) Difficulty coloring is red (hard) to yellow (medium) to green (easy) - anyway to change these to be non traffic light options? 4) If no custom colors, can either "Difficulty coloring" or "Quest level coloring" be disabled so I can have it just stay plain white? The whole thing looks really red/yellow busy to me. I can disable all of it to be plain one color via lua edit, but figured I would ask. will this addon be updated for 7.1? Quester's position keeps resetting back to the default for me. I'll move it where I want it, then sometime a couple minutes later it will move back, and I'm not really sure what's triggering it. I'd like to suggest a feature. I think it'd be great if there was a feature in this addon that allowed us to see the nearest flight point according to the quest we have selected. I don't know if you have ever used Dugi's addon but his addon has this feature. It's called a Taxi system. When you have a quest selected and go to a flight master the flight destination point that's nearest to your selected quest will be marked in red on the map so you can just select the red one and fly to it. World Quests List also has something similar for world quests. I think this would be a helpful feature because then people wouldn't have to open their map, zoom into the map to see the nearest flight point, and match it up with the flight master's flight points. It would save a little bit of time. 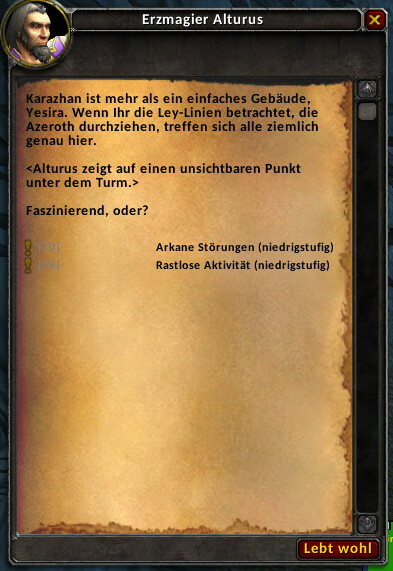 Quest: Hobart Wurfhammer - Questname: So ein Schrott! I have a problem that the position of the Objective Tracker resets when I my pet is summoned/dismissed, and always when I log in.